Wooden Blocks City 100 Pieces is a whole colourful world in a big box just waiting for a child to put it all together. 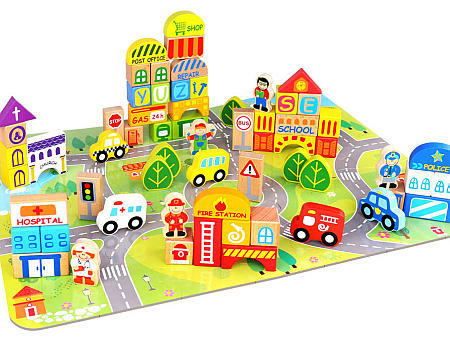 This set comes with a 35 piece wooden puzzle play mat with roads, water and areas to build printed on it. There is a great selection of blocks in different shapes to make a myriad of buildings. No two play adventures will be the same. Among the blocks is an alphabet set and some blocks have the words like hospital, repair, school and police on them so you can create all sorts of bulidings. A fantastic set with many opportunities for fun and learning. We like this because: "So many different ways to play with this toy, a great imagination starter. "